Ralph Leonard “Butch” Wright was born June 4, 1938 in Yakima, Washington and departed this life on December 7, 2018 at St. Luke’s East Hospital in Lee’s Summit, Missouri, surrounded by the love of his family, at the age of 80 years, 6 months and 3 days. He was the son of Herbert Wright and Mildred (Prewitt) Wright. The Wright family moved to Pleasant Hill, Missouri when Butch was 14 years old. He was a 1956 graduate of Pleasant Hill High School and senior class president. After graduation, Butch worked for Bendix Corporation. While working at Bendix, Butch joined the National Guard, and in 1958 he was called to active duty and served one year. At the completion of his active duty, he continued with the National Guard in Raytown, Missouri until he was called to active duty for the second time. After that active duty tour he was stationed at the Nike Base near Pleasant Hill, then he was sent to the 1139th MP CO in Harrisonville, Missouri. Butch ‘s unit was called up again in 1990 in support of Operation Desert Shield/Desert Storm. Butch retired from the National guard with 36 years of service. On August 22, 1965, Butch was united in marriage with Mary Eleaine Hoen and they made their home in Pleasant Hill, Missouri until 1989 when they moved to their farm in Adrian, Missouri. Butch was preceded in death by his wife, Mary E. (Hoen) Wright on April 20, 2016; his parents, Herbert Wright and Mildred (Prewitt) Wright; five brothers, Jerry Wright, Dale Wright, Lloyd Wright, Robert Wright and Michael Wright; two sisters, Jean Green and Hazel Quinn, and one grandson, Corey Gibbons. He is survived by two daughters, Mellissa (Wright) Gibbons and husband Ron of Pleasant Hill, Missouri, and Rhonda (Wright) Walley and husband Jay of Adrian, Missouri; three sisters, Barbara Clawson and husband Bill of Pleasant Hill, Missouri, Mary Samantha Johnson of Banning, California, and Judy Todd and husband Mike of Harrisonville, Missouri; three grandchildren, Trever Wilson of Pleasant Hill, Missouri, Conrad and Anna Walley both of Adrian, Missouri; two step-grandchildren, Crystal Hunter and Kyle Gibbons both of Pleasant Hill, Missouri; numerous great grandchildren, other relatives and many friends. Funeral Services for Ralph Leonard “Butch” Wright will be held at 10:00 a.m. Friday, December 14, 2018 at the Wallace Funeral Home in Pleasant Hill, with Rev. David Owsley officiating. Casket Bearers will be Conrad Walley, Trever Wilson, Jay Walley, Ron Gibbons, Mike Todd and Jerry Land. Burial will be in the Pleasant Hill Cemetery with Full Military Honors provided by the United States Army and V.F.W. Post #3118 Honor Guard of Pleasant Hill, Missouri. 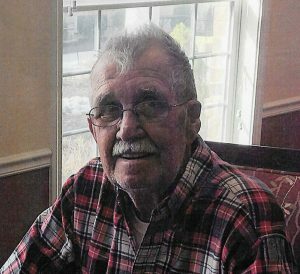 The family of Ralph Leonard “Butch” Wright will receive friends from 6:30 – 8:00 p.m. Thursday, December 13, 2018 at the funeral home. The family suggests contributions to Alzheimer’s Association and may be left at the funeral home.